Solve tangram puzzles in this fun math practice game! 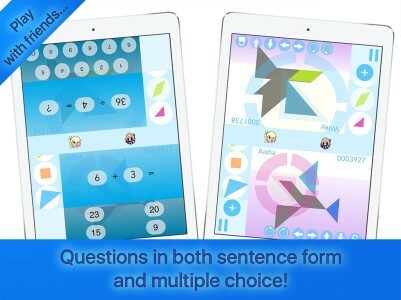 Play with your friends, and solve Tangram puzzles in this great math quiz game. Highly customisable, and beautiful dynamic graphics make the learning experience fun for all. 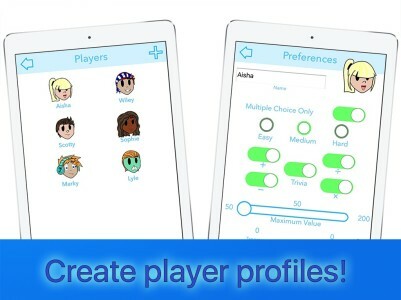 Customize your own avatar, and set your own level of play! Every player is asked individualised questions. Every Tangram (and there are over one hundred) requires exactly 7 pieces. To solve a Tangram you need to earn pieces by answering questions correctly. The more questions you answer the higher your score. The more Tangrams you solve, the higher your score. Practice math skills as you solve Tangram puzzles either on your own, or with your friends. Each players profile can be configured to focus on the individual needs of the player. Difficulty setting and a number range setting to further tune math questions. Math questions are presented as either multiple choice, or math sentences. You also have the option to restrict this to multiple choice only on a per-student basis. Designed to support classroom learning, Classroom Math Drills provides a unique and engaging way to practice a range of elementary math concepts for kids ages 6-12 and up. Students can play as individuals, or in a group. Classroom Math Drills supports multiplayer games either on a single device (iPad or iPhone 6+) or over a local Wifi network. Students can connect their games together and have a race to complete their Tangrams! Multiplayer / multi-device games support up to 2 players on a single iPad or iPhone 6+, or up to 6 players across any mixture of devices! Set up teams of players in a classroom. Classroom Math Drills multiplayer game also supports collaborative play by allowing players to share puzzle pieces between each other. Built to support “Shared iPad”, Classroom Math Drills can store it’s data in iCloud, ready for classroom use with iOS 9.3. Detailed statistics of games are recorded and can be displayed from player profiles. A future update will allow these to be shared with a teacher.